Chuwi a popular Chinese OEM had started an Indiegogo crowdfunding campaign for creating an affordable alternative to Microsoft’s Surface Pro 4 and Apple iPad Pro. The campaign started last month with a goal of $30,000 but it has now raised a funding of around $603,156 USD by 1603 backers which is about 2000% more of their initial goal. And 10 days are still left for the campaign to finish. The Chuwi SurBook has been powered by a powerful Intel Celeron N3450 processor and a 12.3-inch 2736 x 1824 resolution 2K screen. Being a convertible it enhances the productivity because of the kickstand, detachable keyboard, an intuitive magnetic pen. 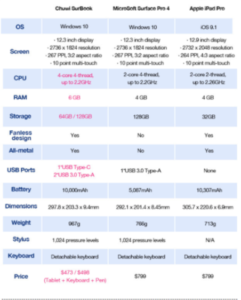 The IndieGoGo campaign page has compared the SurBook with the Surface Pro 4 and iPad Pro which shows how the Chuwi device is better in each factor and that too at affordable price. Chuwi has been producing affordable PCs for some time has now. The only downside of the SurBook is the Intel Celeron Quad Core Processor, but it should do fine with a bit of browsing and office work. Don’t expect to do Photoshop and play games, and the SurBook will do fine. The SurBook also supports active stylus with 1024 points of pressure and has a familiar kickstand. Let’s just wait for this device to be manufactured by the OEM for its launch after a successful campaign.